Sometimes to see something properly, you have to stand farther back. This is true of Chuck Close portraits where a patchwork of many small faces changes into one giant face as you back away. It may also be true of the frogs of Central America, where the pattern of extinctions emerges clearly only at a certain spatial scale. Everyone knows that frogs are in trouble and that some species have disappeared, but a recent analysis of Central American frog surveys shows the situation is worse than had been thought. Under pressure from a fungal disease, the frogs in this biodiversity hot spot are undergoing "a vast homogenization" that is leaving behind impoverished communities that increasingly resemble one another. "We're witnessing the McDonaldization of the frog communities," says Kevin G. Smith, Ph.D., associate director of the Tyson Research Center at Washington University in St. Louis. The analysis, of data collected over many years by Karen R. Lips, Ph.D., an associate professor of biology and director of the program in Sustainable Development and Conservation Biology at the University of Maryland and research associate at the Smithsonian Tropical Research Institute, was published online in the October issue of Ecology Letters. The analysis of frog data was inspired in part by earlier work by Jonathan M. Chase, Ph.D., associate professor of biology in Arts & Sciences, director of the Tyson Research Center and a co-author of the paper. Chase found that when predatory fish were introduced into artificial ponds at the research center, not only did they reduce diversity within each pond, but they also made the species composition of the ponds more similar. In the language of ecology, the predators decreased both alpha diversity, or the diversity within each site, and beta diversity, the diversity among sites. The pond study will be published in the November issue of Ecology Letters. In the new analysis, the role of the predatory fish was played by Batrachochytrium dendrobatidis, or Bd, a microscopic fungus that lives in water and moist soil that sickens or kills frogs. Bd is called a chytrid fungus from the Greek chytridium, meaning "little pot" because small blisters filled with sperm-like, flagellated zoospores form in the skin of infected frogs. Smith thought that the pathogen might be altering the frog communities in the same way the predatory fish had altered the pond communities, causing them to lose both alpha and beta diversity. People had compared the susceptibility of different species to the fungus but no one had looked for changes in the less appreciated beta diversity. The baseline assumption of the analysis was that the pathogen was causing no change in beta diversity, the result that would be expected if it hit all species equally as it swept across the region. Bd is an invasive species whose origin is not known. Hemiphractus fasciatus, which carries its eggs on its back, epitomizes the Central American losses. It was originally found at three of the study sites, but disappeared from all three as the fungus swept through. The fungus is devastating to frogs because it infects the skin, a much more important organ in amphibians than in other vertebrates. Many frogs breathe and drink through their skin and use it as we use our kidneys to maintain the proper concentrations of ions such as sodium and potassium in their bloodstreams. As frogs sicken, their skin peels or sloughs off. Hoping to find a data set appropriate for the kind of analysis he had in mind, Smith got in touch with Lips, a scientist who has monitored amphibian declines in Central America for many years. "The basis of this paper is her decades of work in this area," says Smith, "and the astonishing data set they produced." Lips had species lists from six sites both before and after Bd appeared, and she was able to obtain data from two more sites, for a total of eight. At her study sites, Lips and her graduate students had walked transects during the day and also by night carrying flashlights, looking for frogs, salamanders and reptiles, listening for their calls, and sifting the streams for tadpoles. "We already knew," Smith says, "that at each site we were losing roughly half the species. Our analysis confirmed this. Before the fungus, an average 45 species were observed at each site; after the fungus, the average was only 23. But the beta diversity dropped even more precipitously than the alpha diversity because the fungus preferentially attacked endemic species found only at one or a few sites. Among the species in the study, 42 percent were found at only one site; a disproportionate share of these species disappeared. The loss of rare species drove regional extinctions higher than expected. "Our simulations showed that random local extinctions would have resulted in 41 regional extinctions across the eight sites," Smith says, "but instead we observed 61 regional extinctions." Regional extinction may mean global extinction. "The regional extinctions strongly suggest these species are gone not just from the region but from the planet," says Smith. "It's very difficult to document an extinction, because you have to prove a negative. But if you see that a species is gone not only from point A but also from points B, C and D that gives you a much stronger case." In homogenizing the frog communities, the fungus erased chapters in evolutionary history. 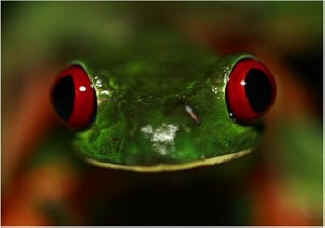 Two rare families of frogs, the Aromobatidae and the Hemiphractidae, disappeared from the region. Among the Hemiphractidae, also known as the marsupial frogs, males capture eggs as the female lays them and deposit them in pouches on the female's back. The female then totes the eggs around with her until they hatch. Homogenization also knocked out ecological diversity. Before the invasion there was a good mix of species in the region. Some species lived in streams, others on land, in trees and underground. But the primarily aquatic fungus killed most of the water-loving species. "Now the frog communities are typified by terrestrial species," says Smith, "which has changed the whole way the system works ecologically." "Our results suggest that the slate of ecological history in these assemblages has been partially erased and that the communities that remain consist primarily of species that are resistant to the fungus." Smith called the fungus an "extinction filter." Not an equal-opportunity killer, it preferentially removes the frogs that make each habitat unusual and interesting. Maybe it should be called a boredom filter instead.